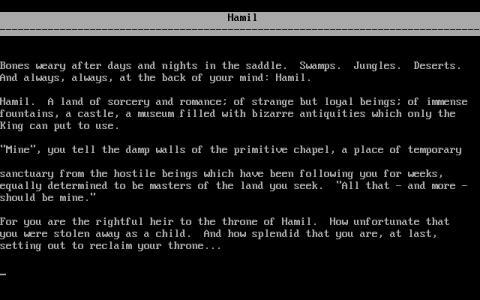 If you've never been introduced to the delights of interactive fiction, like Zork or Shadowkeep, but are intrigued by the notion of taking part in a text-based adventure, then Kingdom of Hamil is actually a fine place to start. While certainly lesser known than the previously mentioned examples, it is no less enjoyable for its relative obscurity and is worth digging out. As is fairly typical of the genre, the game is a sort of fantasy quest-based slice of storytelling, which requires players to embark on a slightly cliched and familiar journey to regain the throne that is rightfully theirs. As this is a text adventure, what this entails is reading through a series of passages which describe your surroundings and then entering various commands to interact with other characters, collect and use items and to solve the myriad puzzles which you will encounter. As there are no graphics, a game like this relies on the skill of its writer, and fortunately Kingdom of Hamil scores highly in this department, with vivid descriptions that create a strong atmosphere, some interesting characters and even some neat little plot twists. The puzzles too are well integrated, with several particularly clever and challenging examples to test your deductive skills, but plenty of useful hints are around if you get stuck, which makes the game accessible to newcomers. The parser is slightly inflexible and restricted, especially when compared to the games of Infocom, but this is nevertheless an enjoyable introduction to the world of interactive fiction.